An interactive presentation and interpretive walk designed to educate and engage residents/community groups on measures they can take to address coyote issues in their communities. An interpretive walk designed to illustrate how and why coyotes use city green spaces and residential areas and how to respond appropriately in a coyote encounter. We attend community events, such as community days and festivals, with an interpretive display and activities to educate the public on coyote life history and how to co-exist successfully. Having trouble with coyotes at your workplace? 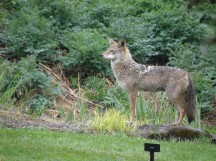 Many outdoor industries expose employees to increased coyote encounters, such as golf courses, parks and industrial activities. We will visit your work site and deliver an interactive presentation and guided walk for staff to identify and mitigate coyote attractants and suggest ways for your staff to be coyote aware. Our school programs, designed for grades K-7 , will teach students what they need to know to co-exist safely with coyotes. For more information on educating your community see our tips on how to co-exist.